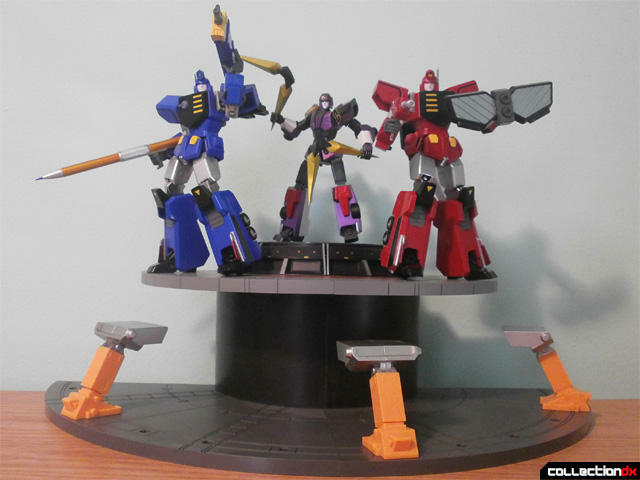 In a rather ambitious endeavor, Bandai revealed last year that they would release the Gutsy Geoid Guard's base from The King of Braves GaoGaiGar in four sets, starting with one quarter of the Big Order Room released with the purple ninja Volfogg. 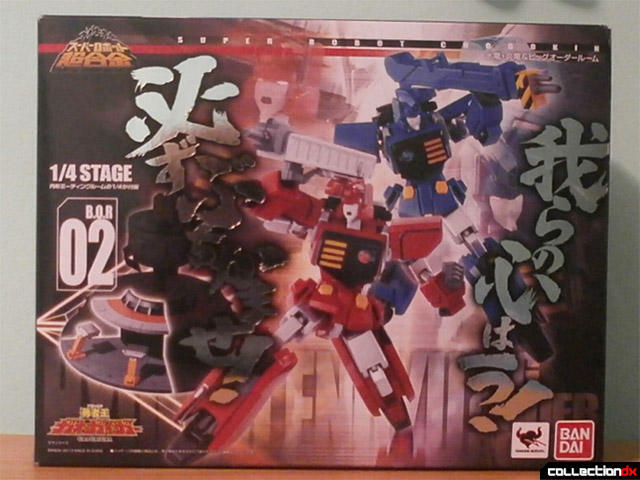 This second part of four, and the last of them to see non-web exclusive release, comes with GGG's Rescue Team robots, HyoRyu and Enryu, and one more portion of the Big Order Room. 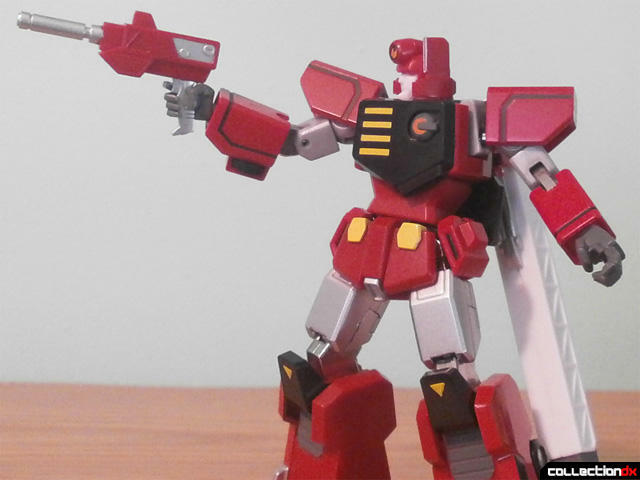 The box itself is standard Super Robot Chogokin fare, just an awful lot larger than usual. It's also emblazoned with quotes from both HyoRyu and EnRyu in extremely stylized Japanese. The plastic trays are pretty standard as well. HyoRyu, Enryu, and their accessories all come in one tray, the Big Order Room components in another. 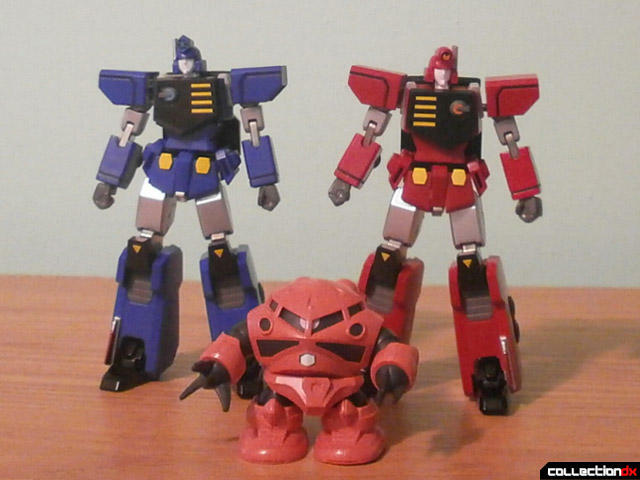 Both figures come in at five inches tall, towering over the two-inch SD Z'Gok. 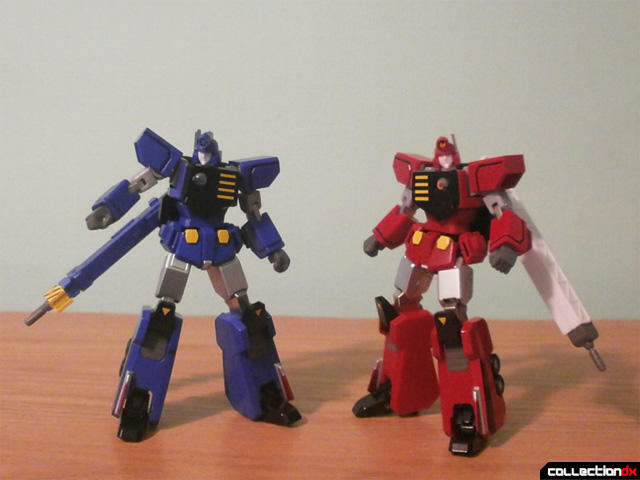 These figures sacrifice any transformation or combining functions for anime accuracy, and it shows, the detail on HyoRyu and EnRyu is wonderfully done, up to par with any other SRC release. Just remove them from the box and attach the Power Crane and Power Ladder to their backs and they're ready for action. 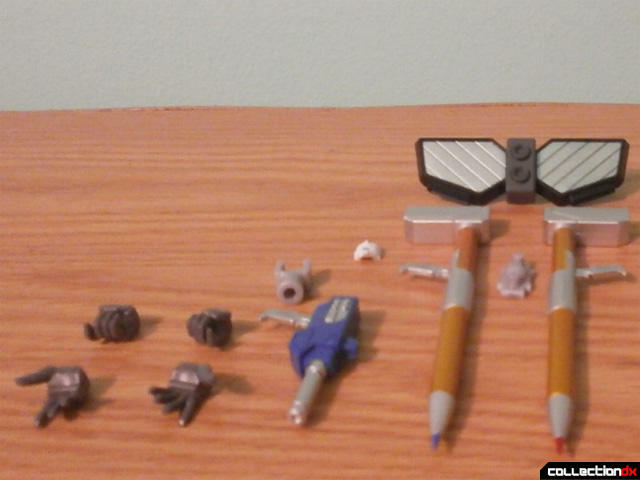 It just wouldn't be a Super Robot Chogokin without a giant pile of accessories. Included are two pairs of hands to hold weapons, and another two pairs of splayed hands. 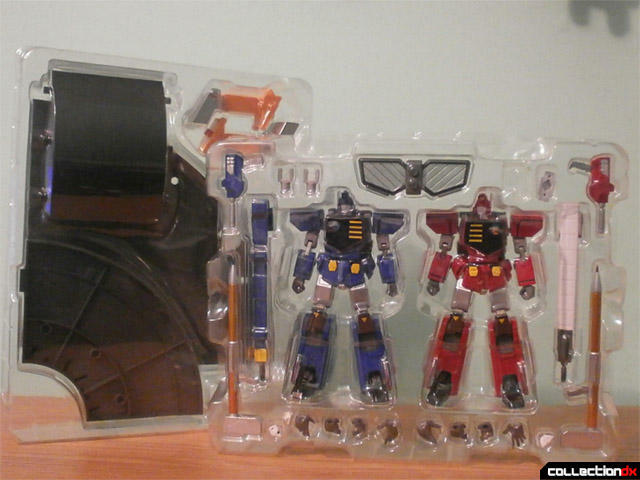 Also included are two Pencil Launchers (the only difference between the two of them is the points are red and blue), the Melting Gun and Freezing Gun, two Tamashii Stand adaptors that clip underneath the figures, two alternate yelling faces, and the Mirror Shield, more recognizable as what becomes ChoRyuJin's chestplate. 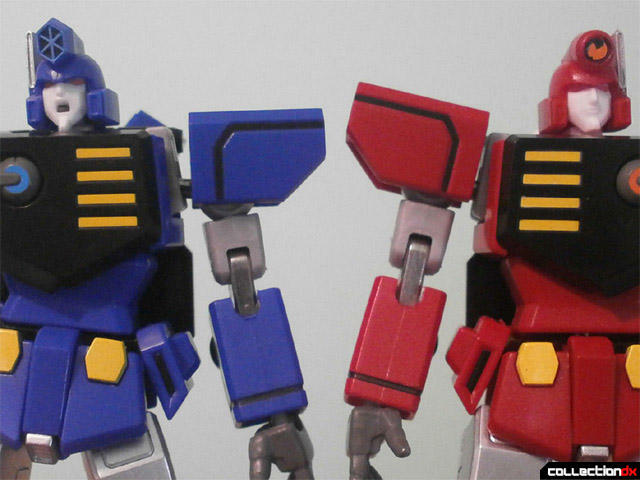 Rather than a whole extra swappable head like with Volfogg, HyoRyu and EnRyu have heads that pop off so you can swap out faces. This is a slightly stressful process, sliding the facepiece out can be difficult. The alternate look is certainly much more expressive though, so the effort is definitely worthwhile. The poseability for these two doesn't disappoint, even up to the standard of Bandai's other modern releases. Double-jointed arms and legs allow a full range of motion, and a ratchet joint in the lower knee ensures the Rescue Team can stay in any pose. 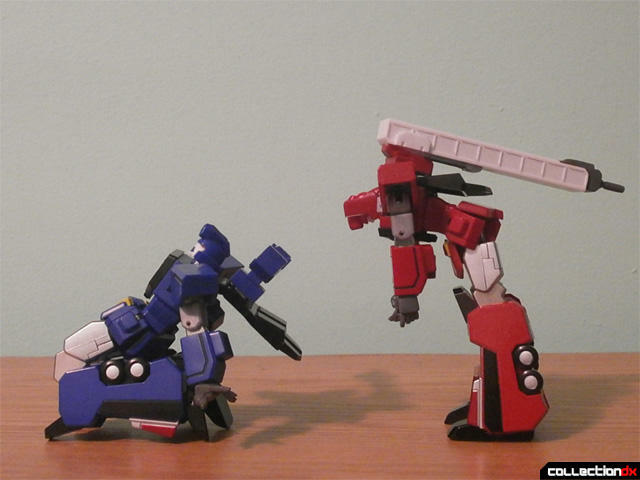 Balance is also aided by the metal content in the feet and shins, the only gokin in this release. 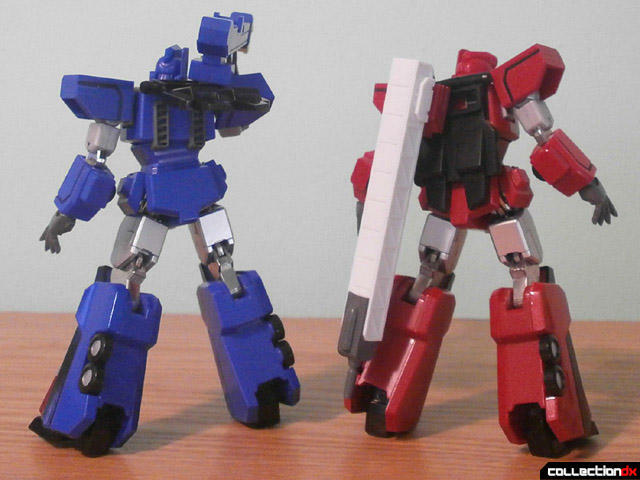 The feet can move freely on ball joints, and the shoulder and skirt armor can rotate easily, so they won't hinder movement. 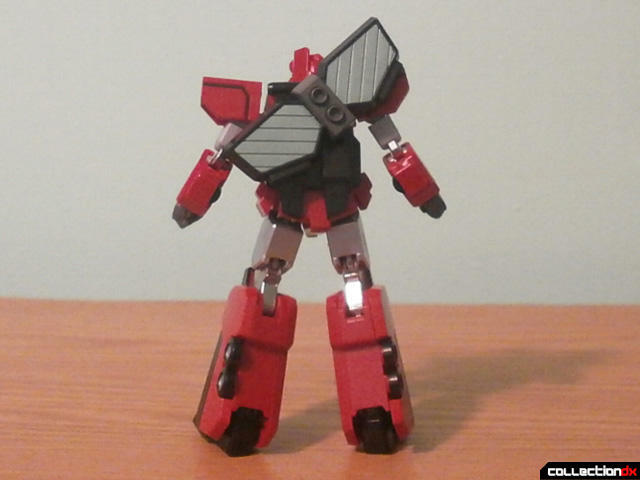 There's a joint in the chest for added front and back mobility, although not quite enough for advanced aerobics. 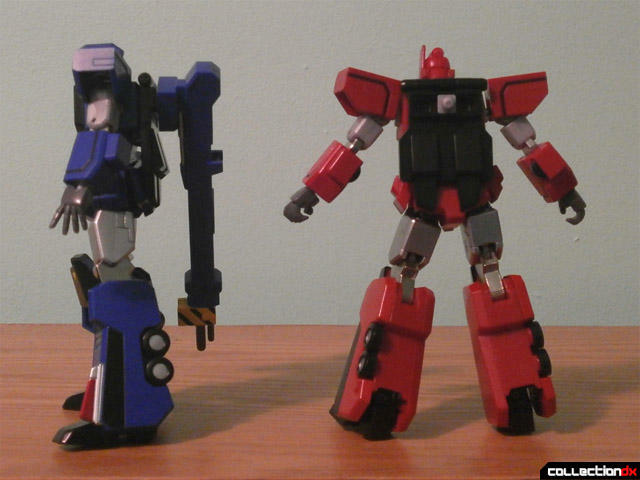 Onto the weapons, starting with the pre-attached ones: HyoRyu's Power Crane and EnRyu's Power Ladder. They attach onto a back flap where they can slide back and forth with ease. The flap can be raised and lowered, and is very stable, even put all the way up, it isn't weighed down at all. Once attached, you can leave the Crane and Ladder in standby position, or raise them into action as the Freezing and Melting Rifle. 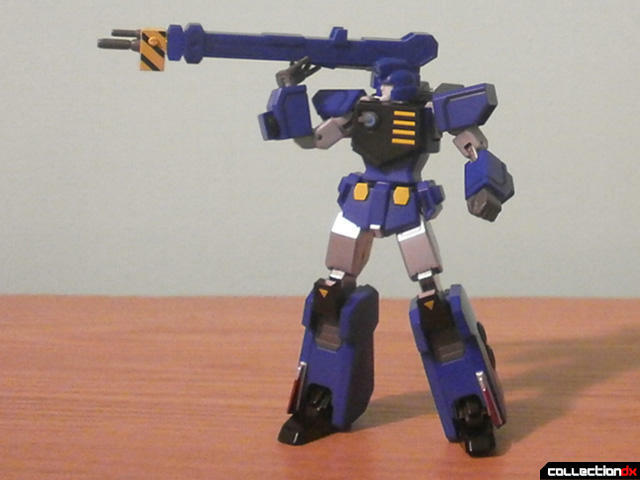 This is where the splayed hands shine, they're open-backed to allow for more dynamic poses with the Rifles. 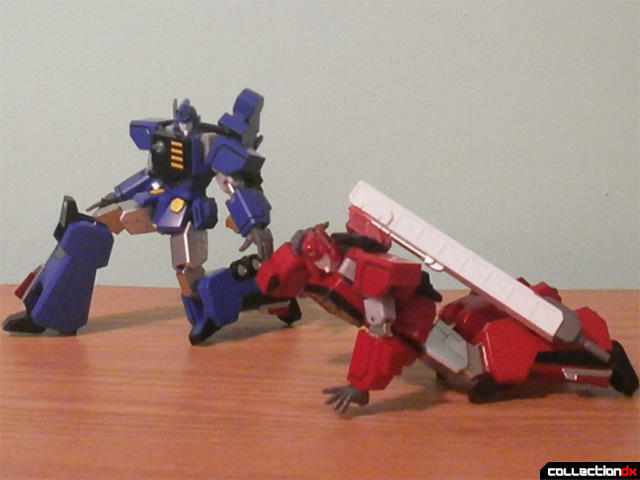 They pop off a little more easily because of it, but the added potential for poses is worth the bother. Next up, the Melting/Freezing Gun. Not really much to say here, it's a gun, and it's accurately painted. The Pencil Launcher, a multipurpose tool. Or maybe they just decided to use it as a net launcher in one episode and a spray cannon in another. 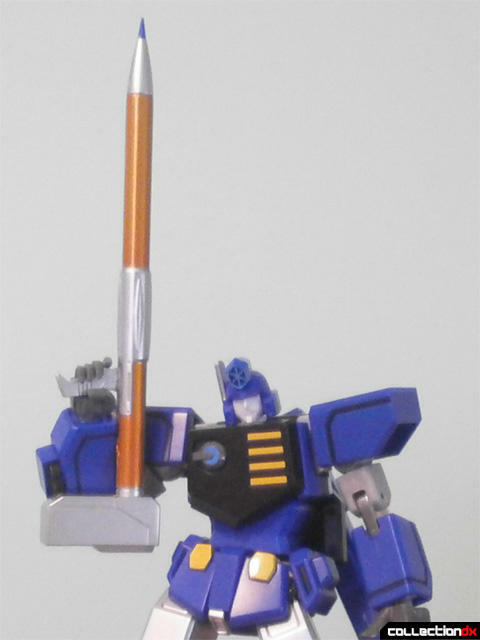 In any case, the only problem with the Launcher is its sheer size, which limits poseability somewhat. 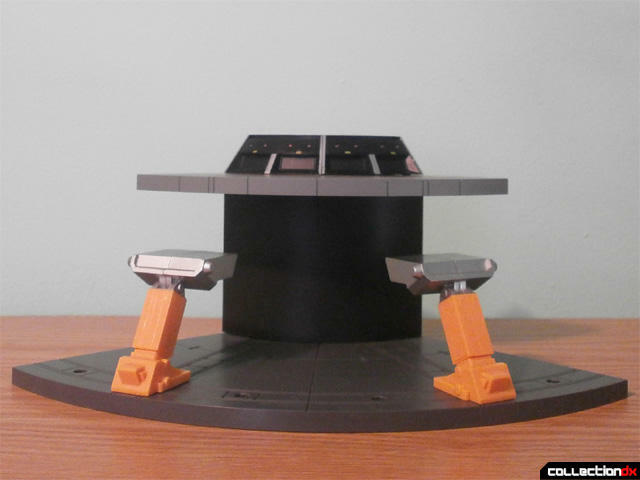 Lastly, EnRyu's Mirror Shield, which in-canon does exactly what you think it would. Can either be held in hand, or attached on the back instead of the Power Ladder. The only weapons this set overlooks is the somewhat hilariously named Chest Thriller and Chest Warmer, but it's a forgivable omission. As advertised, this set also comes with the second part of the Big Order Room. Combining this with Volfogg's gives you half of the entire set, so you can pretend from very specific angles that you own the whole thing. Nothing different between Volfogg's quarter of the Big Order Room and HyoRyu/EnRyu's except that this one comes with two chairs instead of one. Despite being a giant glorified chunk of plastic, the Big Order Room has its potential, from a place to discuss how to take out this week's Zonder, to a giant display base (even though Mother always told you to keep your feet off the table). As mentioned earlier, the other two Big Order Room sets are web exclusive, therefore collecting the whole thing ends up being pretty pricy. 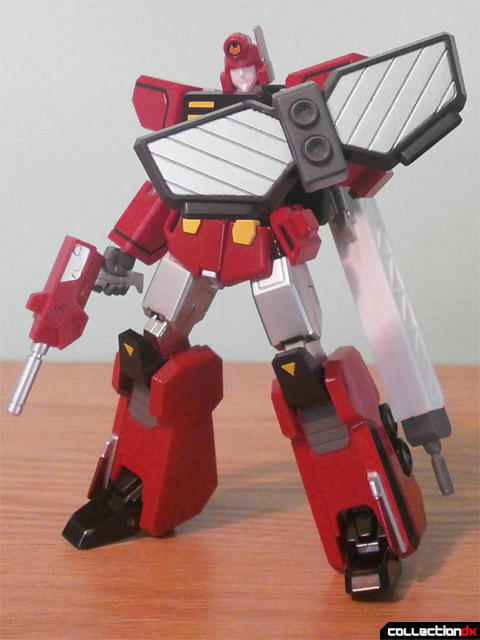 But if you've already got Volfogg's set, or are just a big GaoGaiGar fan, I'd recommend picking this up. 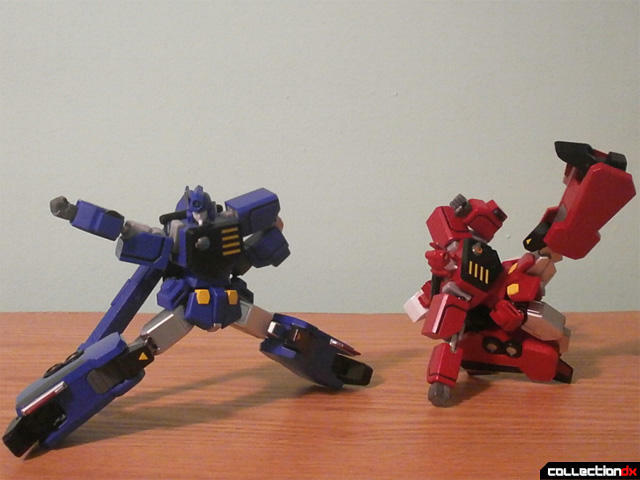 You get two robots for a decent price (less than the upcoming Genesic GaoGaiGar is going to cost, actually) with plenty of poseability and display potential. 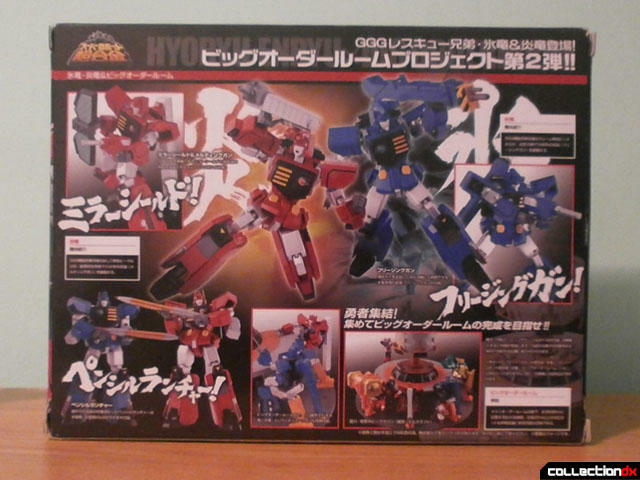 Look forward to next time, where I'll review HyoRyu and EnRyu's brothers from China, FuRyu and RaiRyu. great review thanks, I recently added this to my Xmas list, good to know I won't be disappointed.